Nevada County Housing Resource Manager Brendan Phillips addresses the community gathered at the first of two scheduled forums on homelessness in the community. The second is scheduled for Sat. Feb. 3rd at Peace Lutheran Church. Nevada County housing resource manager Brendan Phillips continues to take the reins from his father, Utah Phillips, in working towards housing Nevada County’s homeless people. 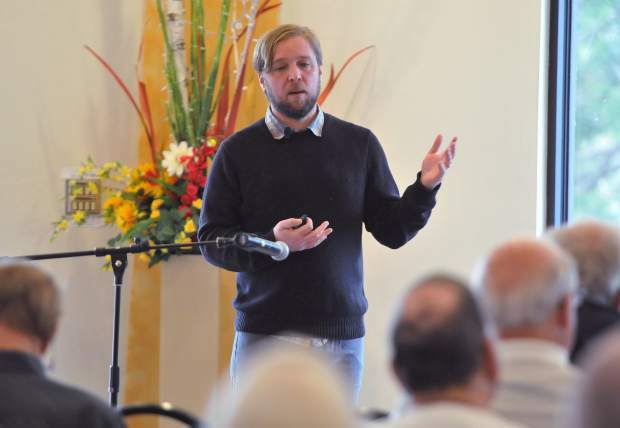 On Saturday, Brendan Phillips was the guest speaker in the first of two public forums dedicated to addressing Nevada County’s homeless, and what can be done to help them. A “housing first” approach was Phillips’ resounding message, and was widely welcomed by those in the audience. Phillips used statistical and experiential data to describe how waiting to provide housing for homeless people ends up costing more in the long run. The longer a homeless person stays on the street, the more susceptible they become in contracting illness or experiences with the judicial system. “When homeless need to be treated at the hospital, it’s a huge strain to the hospitals and a huge cost to the system,” Phillips told the crowd. Phillips also discussed the creation of a homeless day center, where people can connect with social and health services, as a high priority for Nevada County. The county has since yet filled the void created when the Streicher House homeless day center in Nevada City closed last year. During a question and answer session, the stigma of “NIMBYism” (not in my back yard) was discussed in relation to building new housing in the county. Grass Valley council woman Lisa Swarthout said there have been many good housing projects she has seen shot down due to NIMBYism. “We hold onto this feeling of how our community looks, and if we build homes it’s going to change our community,” Phillips said. Sierra Roots’ Janice O’Brien and Hospitality House’s Nancy Baglietto will be the guest speakers during part two of the homelessness forum scheduled for 9-11 a.m. Saturday, Feb. 3 at Peace Lutheran Church, 828 W. Main St., Grass Valley. To contact Multimedia Reporter Elias Funez email efunez@theunion.com, or call 530-477-4230.